The term "chick flick" has become synonymous with melodramatic movies which typically focus on (unrealistic) relationships. (For example, every movie based on a Nicholas Sparks novel.) Occasionally, the definition can cover "zany" female-centric comedies like The Other Woman, but it's mainly those romances. But, there is an exception to every rule and once in a while, we get a "chick flick" which transcends the boundaries of the category. As it features an estrogen-fueled cast, pop music, and lots of costume changes, on the surface, Pitch Perfect appeared to be the epitome of a "chick flick". But, the film had a wicked sense of humor and enough weirdness to satisfy a wide audience. Can Pitch Perfect 2 maintain that momentum? Pitch Perfect 2 picks up three years after the events of the first film. The Barden Bellas, the female a cappella group, have won two more national championships since we saw them last. As the film opens, they are performing at a special event in which the President is in attendance. Unfortunately, during an elaborate mid-air stunt, Fat Amy's (Rebel Wilson) pants split and she flashes the crowd. The incident makes the national news, and due to this, the Bellas are banned from competition. But, as national champions, they will still be able to represent the United States at the international finals, so they set their sights on this. Meanwhile, Becca (Anna Kendrick) has started an internship at a recording studio, as she continues to pursue her dream of being a producer. Emily (Hailee Steinfeld), a freshman whose mother was a Bella, joins the group, as Fat Amy attempts to hide her relationship with Bumper (Adam Devine), a former member of a campus male a cappella group. As if these distractions weren't enough, the Bellas meet Das Sound Machine, a German group who are clearly a force to be reckoned with. 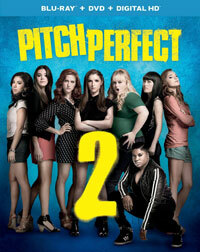 Was anyone clamoring for a sequel to Pitch Perfect? I don't know if clamoring is the right word, but given the breath of fresh air that the first film was, I think that a lot of people were like me -- they certainly weren't averse to it. Pitch Perfect held the somewhat unique position of being a movie which, on the surface, looked like a very vapid movie about singing, but didn't try to hide a decidedly subversive sense of humor. When a movie like this opens with projectile vomiting, you know that something interesting is about to happen. From there, we got a series of clever jokes, burrito assault, and Lilly's (Hana Mae Lee) whispered oddities. The result was a movie which came out of nowhere to make four times its budget and gain a huge following. With Pitch Perfect 2 the powers that be have decided to not mess with a winning formula. Actress Elizabeth Banks, who had a small role in the first film as an a cappella commentator, which she reprises here, has moved behind the camera to make her directorial debut here, and she competently guides the Bellas through their misadventures. It would be an overstatement to say that we get more of the same here, but, again, there was no real need to mess with success. Becca is still abrasive, Fat Amy is still sassy, and Stacie (Alexis Knapp) is still slutty. The movie features that same sense of quirkiness, which comes to a head in a scene which echoes the "Riff-Off" seen in Pitch Perfect. But, this one is filled with crazy cameos and some of the film's funniest moments. But, Pitch Perfect 2 is a sequel and it suffers from some of the same issues which often plague second chapters. The movie feels very episodic and while there's certainly a story, there isn't much of a plot and the overall effect is a series of scenes strung together. Many of these scenes work, but we get the sense that that writers were trying to bring back the touchstones from the first film, as opposed to working them in organically. It's understandable that new blood would be introduced into Pitch Perfect 2, but the new characters don't really work. Flo (Chrissie Fit) is Latina, and while some of her lines are funny, they are also borderline racist. The real weak link here is Emily. Not only does she force her way into the Bellas, it feels as if she's being thrust upon the audience, and I found myself cringing every time that she would break out into her "original" song. As with most sequels, Pitch Perfect 2 is not as good as its predecessor, but it certainly isn't a bad movie. Unable to recreate the fresh feeling of the first film, the makers of this one instead opt to bring us more of the same. The result is a movie which feels familiar, has some solid laughs, but isn't as satisfying. So, in short, it does what a sequel usually does. Pitch Perfect 2 needed more Anna Camp on Blu-ray Disc courtesy of Universal Studios Home Entertainment. The film has been letterboxed at 1.85:1 and the Disc contains an AVC 1080p HD transfer which runs at an average of 30 Mbps. The image is very sharp and clear, showing no overt grain and no defects from the source materials. The colors look very good (as the film is filled with bright tones) and the image is never overly dark or bright. The level of detail is very good, as we can make out textures on objects and the depth is notable. The Disc carries a DTS-HD Master Audio 5.1 track which runs at 48 kHz and an average of 4.0 Mbps. The track provides clear dialogue and sound effects. As one would hope, the music sounds great here, providing palpable bass and detailed effects which allow the individual voices to come through. We get stereo and surround effects which allows us to hear distinct sounds coming from off-screen. The Pitch Perfect 2 Blu-ray Disc contains a large ensemble of extra features. We begin with an AUDIO COMMENTARY with Director/Producer Elizabeth Banks, Producer Paul Brooks and Producer Max Handelman. "Bonus Song Performed by The Treblemakers" (3 minutes) not only offers the song, but also some comments from the actors on the process of shooting the performance. "Extended Musical Performances" offers longer versions of two songs by the Bellas and one by Das Sound Machine. "Das Sound Machine Finale Breakdown" divides the song into "All Vocals", "Background Vocals Only", "Beat Box Only", and "Lead Vocals Only". The Disc contains nine Deleted /Extended/Alternate Scenes which run about 12 minutes. "Line-Aca-Rama" (4 minutes) offers alternate takes of various moments. We get a 3-minute GAG REEL. "Green Bay Rap" (1 minute) has a few of the football players joining in with Das Sound Machine for a behind-the-scenes moment. The actress turned filmmaker is profiled in "Elizabeth Banks’ Directorial Debut" (5 minutes), which contains comments from the cast. "The Bellas Are Back" (6 minutes) shows the actresses rehearsing and getting in shape for the shoot. We go on-set to get a look at the team-building excursion in "Aca-Camp" (5 minutes). "The Making of the Riff-Off" (6 minutes) allows us on-set for the cameo-filled highlight of the film's second act. We see how Louisiana stood in for Denmark in "The World Championships of A Cappella" (9 minutes). "Snoop in the House" (3 minutes) brings us some very awkward interviews with the rapper. "Residual Heat Internship" (2 minutes) is basically an overview of the internship scenes. We learn how a love/hate relationship in the first film has grown in "An Aca-Love Story: Bumper and Fat Amy" (5 minutes). "Legacy: Hailee Steinfeld" (6 minutes) shows how art imitated life, as the actress really was the new one on set.